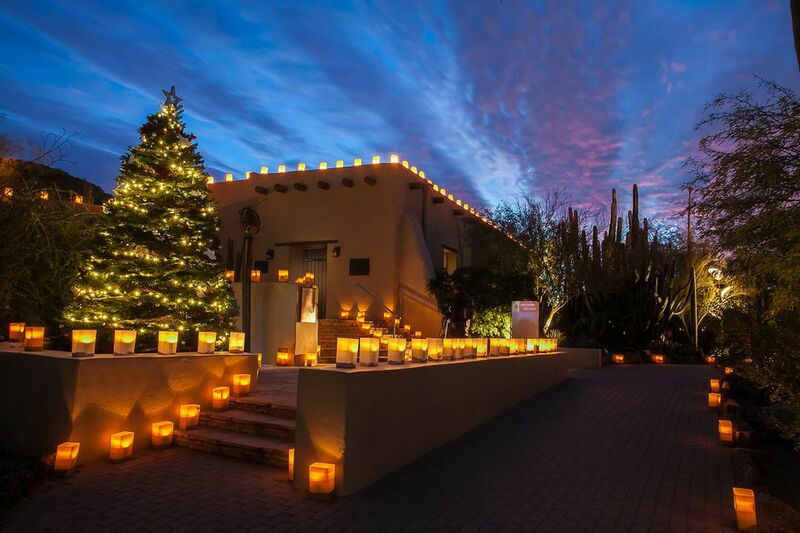 Each year during the holiday season, the Desert Botanical Garden in Phoenix lines the paths of its extraordinary desert garden with thousands of luminarias for "Las Noches de las Luminarias." Combining the evening desert glow with the unique environment of the Desert Botanical Garden, live entertainment, and local foods and wine, "The Night of the Luminaries" is an event that you won't want to miss if you're visiting Arizona in November or December. Although children are certainly welcome to attend these special events, they are more of an ambiance-style event than an activity-based one, and "Las Noches de las Luminarias" is much more suited to a romantic evening for two, strolling along the luminaria-lit paths in the desert, sipping hot coffee, or tasting wines from around the world. The Desert Botanical Garden kicked off the 2018 season on December 1 and has events throughout the month including December 1-23, 26-31 which each run from 5:30 to 9:30 p.m. Tickets are available online to both members and non-members (at different costs) and we highly encourage buying in advance as they often sell out. Along with the luminaria-lit paths and romantic ambiance, the Desert Botanical Garden also features a number of live entertainers nightly, ranging from mariachi and dance to classical crossover, Americana, Gypsy Soul, and swing. Among the acts featured for the 2018 season include Mariachi Pasión and Brian Foley Dynamic Theatre, Run Boy Run, Traveler, Poranguí, AJ Odneal, Yellow Bird, Cellocello! and more. To put you in the holiday spirit, there are also a variety of handbell ensembles who will be performing Christmas classics on select evenings throughout December; acts include Desert Bells International, Dayspring Bells, and Handbell Ringers of Sun City. There are a few rules to keep in mind when visiting the Desert Botanical Garden. This event, like all events at the Garden, is a non-smoking event, even outside, so you will have to exit the premises if you plan to smoke during your trip. Also, no pets are allowed and all children must be accompanied by an adult at all times—no wandering off the paths! It's also important to remember that even on the nicest of evenings in December, it will get cool after sunset. Don't let the daytime temperatures fool you—wear a jacket and layers if it gets breezy before you leave for this evening activity. Food and alcohol are available for purchase at the Desert Botanical Garden during Las Noches de las Luminarias, and there are hot cider and cookie stations along the paths as well as a wine tasting area. There is also a buffet dinner available at an additional cost, and Gertrude’s Restaurant will also be open—though reservations are highly recommended.